Grey Falcon adult Falco hypoleucos, central southern Queensland, June. Identifying raptors in the field can be challenging, especially when light is poor, viewing angles are less than desirable, and encounters are brief. Typically, however, all three circumstances come together. Richard Fuller's wonderful shot (above) is one of a series. It would be quite ambitious to identify the bird by that photo alone. Nankeen Kestrel Falco cenchroides, Gluepot Reserve, South Australia, November. 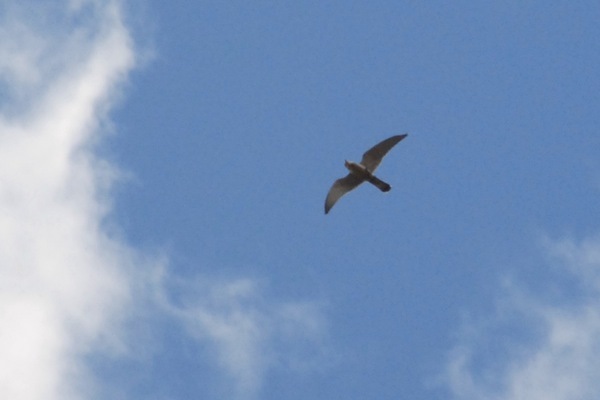 A Nankeen Kestrel. 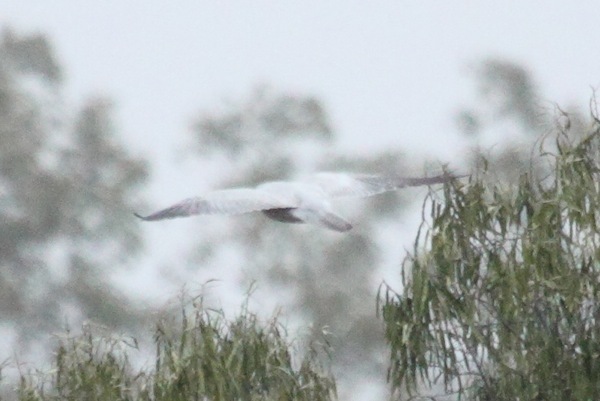 Long-tailed, the black tailband just discernible, wings narrower and positioned more forward than those of the Grey Falcon in the photo below. Grey Falcon adult Falco hypoleucos, SW Queensland, October. 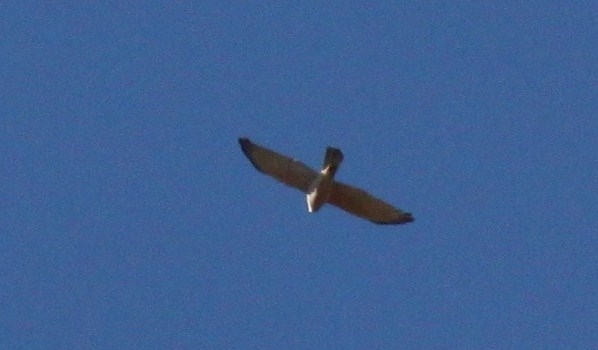 Another common suspect is the Brown Goshawk. 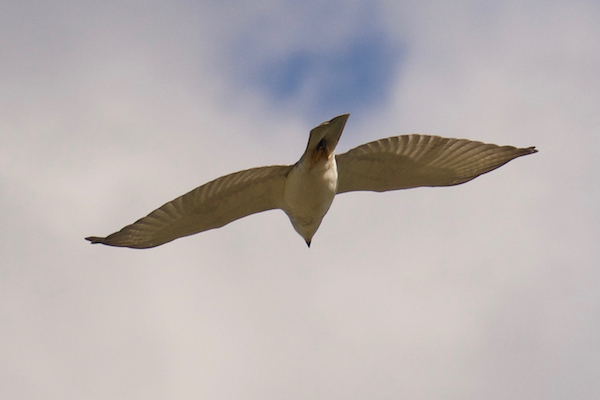 When seen from below, a good fieldmark is that its wings grow narrower towards the body. Further, the Goshawk appears less stocky, and the yellow colour on the head, legs and feet is far less bright and lacks the rich orange quaity that is typical in adult Grey Falcons. Beware of calling your bird a Grey Falcon on the basis of black wingtips, they are not diagnostic. Check out the next photo. Brown Goshawk Accipiter fasciatus, near Pine Creek, Northern Territory. Even harder is the case of the Grey Goshawk. As with the Brown Goshawk, the Grey Goshawk's wings are concave, i.e. 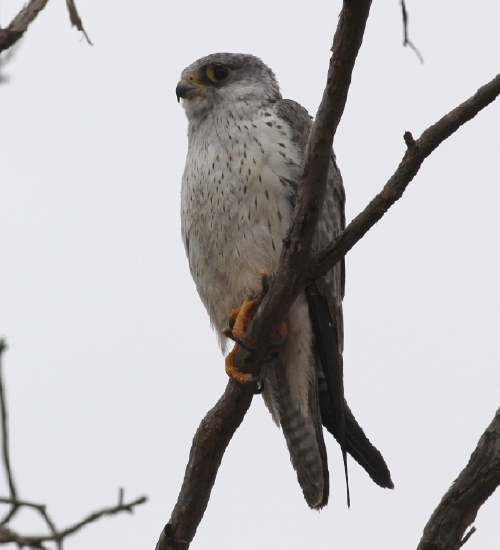 narrow at the base, and the yellow of the legs, feet and cere is much less bright than in the Grey Falcon. 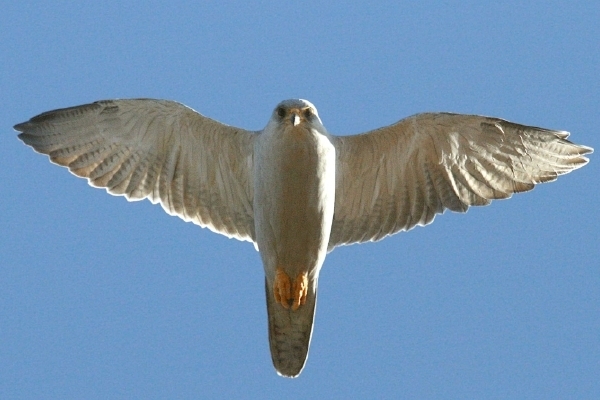 Further, both species of goshawk lack the fine black streaking of the adult Grey Falcon's underbody. Grey Goshawk Accipiter novaehollandiae, NSW. In flight, Grey Falcons have broad wings that are broadest at the base, a solid body, and a comparatively short tail with no distinct terminal or sub-terminal band. All in all, the Grey Falcon has a rather stocky appearance. Grey Falcon adult Falco hypoleucos, central southern Queensland, November. The identification of juvenile birds has also led to some confusion and, consequently, erroneous conclusions. In May, young Grey Falcons - i.e. birds in their first year - look like the one below. The most conspicious feature is the black 'blotching' of the white underparts. On the youngster on Stephen Knights' photo you can see the first grey adult feathers with the faint black centre line emerging on the breast. One or two of the juvenile feathers, white with the large black streak, may soon be one of the last bits of evidence of an individual's young age. Cere and orbital ring are not yet of the bright orange-yellow colour of the adult, and the bases of upper and lower mandible are as well not as rich yellow as in the adult. Only legs and feet have almost acquired the adults' bright orange-yellow. Not quite discernible on this photo are the brownish 'shoulders', i.e. the contour feathers of the folded wing. Just exactly when the birds acquire those brown 'shoulders' and when they moult out of them I don't know yet. In May, typically the Grey Falcon family is still together, a behaviour quite unlike other falcon species. Whether the young are then still truly dependent on their parents or whether they only enjoy free food and the company is difficult to find out. Plenty of scope for further research. Grey Falcon juvenile, southwestern Queensland, mid May. Schoenjahn, J. (2010). 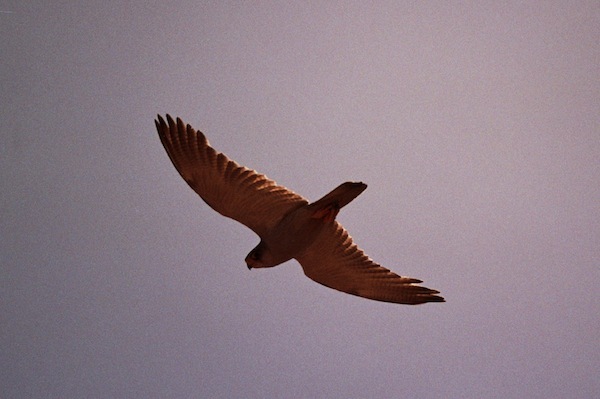 Field identification of the Grey Falcon Falco hypoleucos. Australian Field Ornithology 27: 49-58.